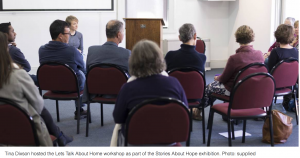 At Road to Refuge, we were very fortunate to work with Tina & Renee Dixson to bring their project ‘Stories About Hope’ to Melbourne and Sydney. Through this project, we were able to share the stories that have long been silenced or ignored in the nationwide debate – and take a new frame to people from refugee backgrounds that recognises their inherit strength, courage, and resilience. With the help of those involved in this collaboration, we discovered some of the crucial ways to address this issue. Here are 9 ways that you can improve your messaging and ensure that it is ethical, representative and supportive. Activists Tina and Renee discuss racist microaggressions, Queer refugee identities and their art project Stories About Hope. Stories About Hope: The art exhibition detailing the experiences of queer people from refugee backgrounds. Stories about Hope explores the dignity, identity and strength of people from refugee backgrounds. The exhibition celebrates the courage and resilience of people who have undertaken diverse journeys to Australia throughout different points in history. “For me, it was important to challenge the negative rhetoric about people from refugee backgrounds, and shift discussions towards human dignity, strength and hope and offer solutions,” Renee said. Exhibition offers a lot of hope for future. Shining a light on the stories of people who have sought safety in Australia the Stories about Hope exhibition will open at the Inner West Council’s Chrissie Cotter Gallery today from 6pm to 8pm. Renee Dixson, who produced the exhibition, says the experience of forced displacement “should not define someone forever”. How would you describe your approach, the concept and methods used in your work? I use storytelling to draw on my cross cultural and personal experiences along with social issues which are being faced in Australia, some of which have directly affected me. I examine these stories as a basis for my inspiration. They form the foundations of my practice, not only as a mode of self-discovery and self-representation, but also as an instrument to explore the country that I now call home and the people in it. It took several years for Stories about Hope to come to its current form. My very first impulse to do something was after an exhibition my partner and I attended back in 2013. The exhibition featured art works drawn by people in an immigration detention centre. The drawings were beautiful and painful simultaneously, yet the tour guide was very pessimistic. One of the visitors asked him whether there was anything positive or hopeful for these people in the detention centre, he responded: “No. Everything is bad”. While I could understand his embedded political claim to close the camps, his pessimism was erasing human agency, reducing the hope that had been created in these individuals through their art and getting their voices heard. At that time, I could barely speak English, so I didn’t have a chance to respond to him, but that overheard conversation has stayed with me. The topic of refugees is one that takes up copious amounts of time in our Parliament, in the media and most likely dinner party discussions. Everyone has an opinion – but few have a direct experience. So tonight we speak with a couple of people who have. What is the real experience of a queer person seeking asylum in Australia? What is the ‘survivor guilt’ that LGBTI refugees can experience? How can we change the narrative of refugees in Australia from one of trauma to one of hope? In an interview that will challenge your thinking on queer refugees, we were joined by Renee and Tina, refugees advocates and creators of the exhibition Stories About Hope. Renee and Tina Dixson share their story about fleeing their home country because they were queer to come to Australia. The women want to change the narrative around refugees stories to one of hope. They have put together a compelling exhibition for World Refugee Week called Stories About Hope. It explores the human dignity, identity and strength in people from refugee backgrounds through photography and short films. The exhibition celebrates the courage and resilience of participants who have undertaken diverse journeys to Australia throughout different points in history, and through their stories, prove that your past does not define you and can give you strength to move forward with confidence. It was an emotional experience for many during the recent Stories About Hope exhibition. The exhibition was sponsored by Amnesty International and Rural Australians for Refugees Southern Highlands (RARsh). Does your past define you? Or does it give you strength to move forwards? Find out at this exhibition. Sydney-based artists from refugee backgrounds are working on a new multimedia social art project that aims to celebrate the survival and successes of refugees. The artists believe strongly in the power of art to inspire hope, and in the connection between art and social justice.